Home news TRUMP ADDRESSES NORTH KOREA AT MICHIGAN RALLY. WHAT THE CROWD CHANTS BACK LEAVES TRUMP SPEECHLESS. TRUMP ADDRESSES NORTH KOREA AT MICHIGAN RALLY. WHAT THE CROWD CHANTS BACK LEAVES TRUMP SPEECHLESS. 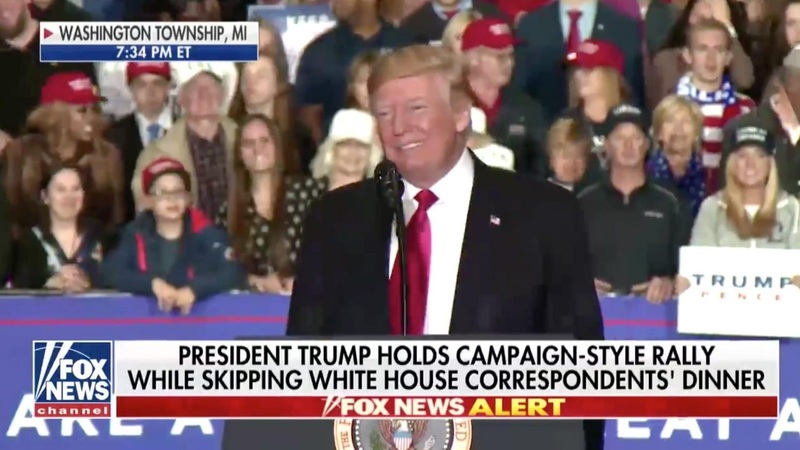 Instead of attending the White House Correspondents Association’s annual fundraiser in Washington on Saturday, President Donald Trump was in Washington Township, Michigan, delivering a speech at a campaign-style rally before a packed house. And at one point, the crowd left the president speechless. Trump’s speech touched on any and every topic, from the economy, to the WHCA’s dinner, to rapper Kanye West. But it’s when Trump began talking about North Korea that the crowd erupted almost immediately. Trump was praising Chinese President Xi Jinping when he noted how helpful he’s been with North Korea. “He’s been a great help on the border with North Korea and a lot of good things are happening there. A lot of good things,” Trump said. Within seconds after mentioning North Korea, the crowd erupted in a “NOBEL” chant, leaving Trump temporarily speechless. He stepped away from his lectern, with a huge smile, obviously thankful his supporters believe he deserves a Nobel Peace Prize for his work to bring peace to the Korean Peninsula. Indeed, Trump is being credited with leading the charge to normalize relations with North Korea. So much so that South Korean Foreign Minister Kang Kyung-wha gave Trump most of the credit for the surprising turn-of-events on the Korean Peninsula. How many presidents have won a Nobel Peace Prize? While it remains unknown if Trump will be awarded a Nobel Peace Prize, four of his predecessors have been honored with the distinction, including: Barack Obama, Jimmy Carter, Woodrow Wilson and Theodore Roosevelt.